Having a weakened or abnormally large heart muscle is known as cardiomyopathy. Because of the wide range of conditions that cardiomyopathy can include, it is often separated into categories. These are named by how the disease affects your body. The first is the “primary” group, which affects the heart alone. The other is the “secondary” group of myopathies that are caused by other illnesses affecting the body. Cardiomyopathy is a condition that can be mild with few symptoms, but can also lead to heart failure in severe cases. Regular primary care plays an important role in disease prevention and overall wellness. If you do not have a primary care physician, we invite you to visit our Primary Care website to find quality care close to home. Our doctors, clinicians and staff members are devoted to providing the best care possible, delivered with human touch. We are committed to treating each and every person we serve with dignity and respect. To schedule an appointment with a specialist of the Seton Heart Institute, please call toll-free 877-860-1141 or request an appointment online. In general, you can decrease your odds of getting cardiomyopathy by making some changes to your lifestyle. These include exercise, stopping smoking, and maintaining a heart-healthy diet. Due to how dangerous this condition can be, symptoms like these should not be ignored. Cardiomyopathy can lead to more serious heart complications. These can include blood clots, heart failure and cardiac arrest (heart attack). It can be hard to properly diagnose cardiomyopathy. Your doctor will typically use a variety of measures to determine if you are at risk. These include physical assessments, your family history and special tests such as X-rays, electrocardiograms or blood tests. Dilated cardiomyopathy is the most common. This occurs when the left ventricle of the heart becomes enlarged, disrupting its normal function. The enlarged heart tissue prevents blood from being pumped normally. This will result in less blood delivered to other organs in the body. 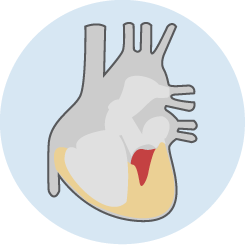 Restrictive cardiomyopathy involves the heart muscle becoming rigid and firm. As the tissue becomes less elastic, the chambers are not able to expand and fill with blood. This prevents adequate blood flow to pass through the heart and be delivered to other areas in your body. Hypertrophic cardiomyopathy occurs from abnormal heart muscle growth or thickening. As the tissue becomes thicker, the pumping chambers shrink and the tissue stiffens up. This creates a problem for the heart, as the thicker muscle and small chambers prevents it from pumping blood effectively. If these can’t help, pacemakers or defibrillators may be implanted to monitor heart rhythm and health. For patients with advanced stages of disease, surgery may be necessary to replace ventricles of the heart. In the most severe cases, an entire heart transplant may be required. The goals of treating cardiomyopathy are usually based on symptom relief. As the causes of cardiomyopathy are so varied, treatment options are unique for each patient. An assessment by a qualified heart doctor will be necessary to determine how best to manage your health. For most patients, the complications with cardiomyopathy can last a lifetime. Surgery and other treatments can help alleviate symptoms and provide relief, but they aren’t always able to correct the abnormalities of the heart. Medications should be carefully managed by your heart doctor to ensure that you’re receiving the right dosage for your condition. Patients should consult with their doctor if their symptoms do not improve or the feel like they are experiencing side effects. Patients who have had pacemakers implanted will need to rest for several weeks after surgery. They will also need to learn about the restrictions associated with pacemaker use, as some devices can interfere with their function. Managing cardiomyopathy can be a life-long struggle. But the right combination of treatments can make the condition more manageable and help restore your quality of life. We welcome referrals from cardiologists, primary care doctors and other medical professionals. We offer an affordable Heart Healthy CT Scan for people who want to determine their heart disease risk. Seton Heart Institute Women’s Heart Center is designed to help women who have survived heart-related crises or who are at risk for having one in the future through specific prevention, diagnosis and treatment options. Is the War Against Salt for a Healthier Heart Over?